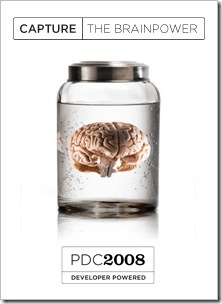 This morning we went live with the 2008 Professional Developers Conference aka PDC 2008 web site. Registration is also live with a nice discount for early registration. If you want to learn about the future of the Microsoft platform this is the absolute best conference for that. This is the conference where we unveil the big important stuff. .NET, Windows XP, and Windows Vista are all products that were first previewed at PDC. This year the focus is on Services, Windows, Mobility and next-gen developer tools. Uh, huh, just that. :) Of course, I’m sure there’ll be lots of other little surprises as well. Tech-Ed is the conference for getting deep technical training on current generation products. This conference has now been split into a developer conference and an IT professional conference. MIX is the conference for those focused on development and design of consumer web sites.